The 17th Marine Regiment was a composite engineer regiment of the United States Marine Corps subordinate to the 1st Marine Division. It was formed primarily from units of the Division, and was inactivated during war with the 1st and 2nd battalions remaining in the Division. The 17th Marine Regiment participated in the Battle of Cape Gloucester. The subordinate battalions, as independent battalions in 1st Marine Division, participated in all of the Division's major operations during the war. According to the 19th CB's log it was assigned to the 1st Marine 11/05/42 prior to leaving the States. On 04/03/43 "By Division General Order No. 74 of 3 Apr'43 - First Marine Division: the 19th CBs designation will be as follow's in the future, when attached to First Marine Div., Fleet Marine Force ----Third Battalion, Seventeenth Marines (Engineers) c/o FPO San Francisco. 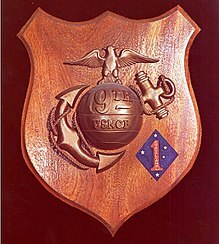 Calif." The 19th was "at Cape Gloucester from 27 Dec 43 until 4 May 44" and remained with the 1st Division until "1 Jul'44 when The 19th CB was detached from the operational control of the 1st MarDiv, re-designated the 19th NCB and transferred to the 3rd Marine Amphibious Corps. note: when the 19th CB was assigned to the Marine Corps 11/05/42 it lost one company and 1/4 of Hq Co. Those men were assigned to the Fleet Marine Force replacement group (as the 19th replacement group). That group would form the core of the 121st CB which would become the Third Battalion, Twentieth Marines (Engineers) c/o FPO San Francisco. Calif.